This includes . . .
Ch. 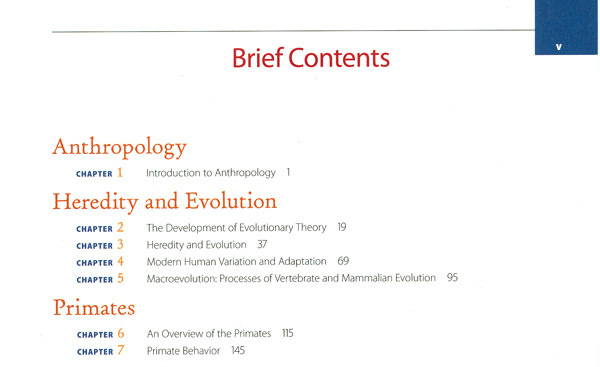 2, "The Development of Evolutionary Theory"
Ch. 3, "Heredity and Evolution"
Ch. 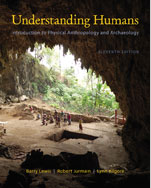 4, "Modern Human Variation and Adaptation"
Ch. 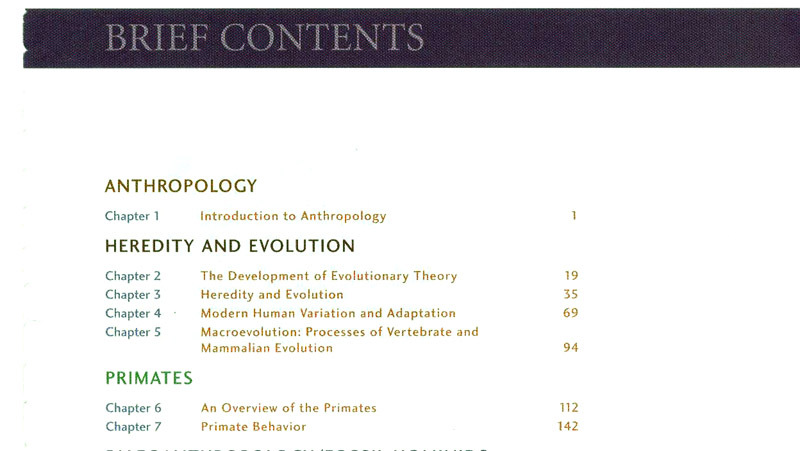 5, "Macroevolution: Processes of Vertebrate and Mammalian Evolution"
do not worry too much about the biochemistry and biostatistics? The first exam will cover Chs. 1 - 7 of the text, in-class videos / film, important e-mails, Forum posts, assigned web materials and lectures. 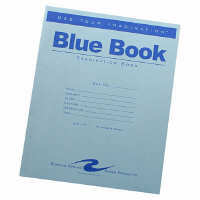 The exam will cover materials up to and including Week 06. Grading information is available on . The second exam will cover Chs. 8 - 12 of the text, in-class videos / film, important e-mails, Forum posts, assigned web materials and lectures. The exam will cover materials up to and including Week 10. The final exam will be cumulative, with emphasis on Chs. 12 -15 of the text, in-class videos / film, important e-mails, Forum posts, assigned web materials and lectures. Essay exams usually provide a better learning experience and, in addition, afford practice in writing. These will be given at the same times as the other exams. If you would prefer an essay exam or exam please let me know one week ahead of the scheduled exam dates. The first exam will cover Chs. 01 - 07 of the text, in-class videos / film, important e-mails, Forum posts, assigned web materials and lectures. The exam will cover materials up to and including Week 06. The second exam will cover Chs. 08 - 12 of the text, in-class videos / film, important e-mails, Forum posts, assigned web materials and lectures. The exam will cover materials up to and including Week . The final exam will be cumulative, with emphasis on Chs. 13 -15 of the text, in-class videos / film, important e-mails, Forum posts, assigned web materials and lectures. With prior consent of the instructor, you may take makeup exams at any of the times scheduled by the Sociology-Anthropology Department. These times will also be announced in class. Pick up your makeup exam in Cina 228, not the classroom. Makeup Exam scores will be posted as soon as they are ready on the web on .